Take a deep dive into movie magic with this poster that invites you to screen 100 iconic films. From Casablanca to Jaws, you've already seen some of the classics and blockbusters. Grab the popcorn and take a deeper dive into movie magic with this poster that invites you to screen 100 iconic films. As you do, use a coin to scratch off each title and reveal surprise, movie-related artwork underneath. It's an interactive way to enjoy essential viewing for any film buff. Made in the UK, which gave us Charlie Chaplin, Alfred Hitchcock, and Ridley Scott. Click here to see a partial list of movies and directors included. Poster arrives rolled in tube. When we want to have a quiet night in and watch a film, we select one from the poster (we've started with the ones we both have not seen before). And it is such fun to scratch them off - almost like a game. Great birthday gift- unique and fun! I bought it as a +1 gift for my boyfriends birthday. The packaging it came in was cool and worthy. My only issue, the scratch off "stuff" is somewhat difficult to scratch off. We are using as inspiration for our movie-cation (movie education) - each time we want a new movie to watch we refer to our guide! Worst scratch off list ever. It was SO difficult to scratch off to see the movies. So much that the paper ripped and I wasn't even scratching it that hard. I don't like that the scratch part moves out of the box and makes the rest of the poster look terrible. Very poorly designed. Fun product with a variety of movies! 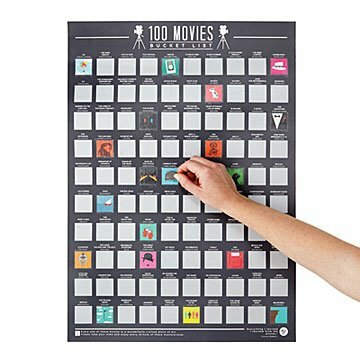 The poster is a fun way to display your love for watching movies or to give you movie suggestions. Comes rolled up so it needs to lay flat before trying hang by itself. I wouldnt buy this product again. We enjoy this item. It is easy to scratch off and fun to use. I would definitely recommend this product!! We've hung it up on our wall and randomly pick a movie to watch. We love it! My husband tacked this up beside his favorite watching chair, and looks forward to scratching them all off!